Holiday gifts make us smile–at least that’s the goal! Whether it’s a new ski tuning tool or a new jacket, the right gift can brighten someone’s holiday, and that makes two people happy. Looking for ideas? Fortunately, whether shopping near Killington or Okemo, Rutland or Woodstock, the options are as appealing as fresh corduroy. To help, here is a gift list. While no gift list could ever be all-inclusive, this one has some things that are fun, some things that are naughty (financially at least), and, of course, many things that are nice! Many guys (fathers, sons, boyfriends) like tools. This is not a surprise to many wives, moms, girlfriends and daughters. Ski tuning or power tuning tools may provide both the receiver and giver with sharp edges. Yes, these ideas are “win-wins.” Interested? To start, maintaining a tuned ski is a worthwhile goal. Racers know well-tuned skis turn, glide, and hold on firm snow, making for an all around better experience on the slopes. Weekend warriors as well as ski racers can benefit from sharp skis. Still, professional tuning can be expensive and not all professional tunes are equal. Unfortunately, while periodic shop tunes may suffice for occasional escapes, those who ski frequently know that one day of hard skiing can dull even the sharpest edge. Many local ski shops will also carry tuning tools and can offer their advice on which ones they recommend. Edgetune, Inc., offers a unique home tuning tool: the EdgeTune Pro II. Using ceramic grinding technology, engineer Dave Hibbert has produced a tool able to provide a machined, stone grind for side edges. Combined with a Dremel, this tool brings ceramic stone grinding to home tuning. Match top skiers with an unfair advantage with superior tunes! Okay, not everyone wants a home stone grinder. Still, performance skiing requires polished edges and waxed ski bases. Fortunately, from Reliable Racing to FK-SKS and Sun Valley Ski Tools, a wealth of file guides is available for hand tuning and polishing. In fact, from approximately $30 for a basic plastic file guide to more than a $100 for a sophisticated guide with rollers, file guides are capable of functioning for years. My choice? I favor the SKS Racing Combi SC with rollers. With a carbide steel blade, a sidecutter for the sidewall, and the ability to insert diamond stones for polishing, this tool can comfortably maintain a sharp side edge at various angles. Waxed skis glide faster and turn more easily. Still, as skis have evolved, the use of an old flatiron can pose risk! In fact, last season I noticed that several skiers who used traditional irons experienced edge separation on their bases. Gift suggestion? The SKIMD Pro-Glide (formerly Wax Whizard) is a round cylinder with a cloth covering which uses the principle of line pressure–contact on a round cylinder–to create sufficient pressure to melt rubbed wax on the ski base. Tested for more than a decade,Pro-Glide simply has the skier rub wax onto a ski followed by approximately two minutes of polishing. Used following a shop hot wax, the Pro-Glide has maintained my skis–without freezer burn on the base–for an entire season! Are your feet often cold? I understand. Years of coaching and frostbite have left my feet with poor circulation. Fortunately, though, boot heaters help. In fact, the Hotronic FootWarmers–similar to Therm-ic–are easily inserted in virtually any boot and feature several temperature settings. They include rechargeable batteries. My Hotronic batteries sit on the top of my boots and often offer two full days of heat while blasting my toes. If you’re unfamiliar with this product, know these heat a small pad under the toes-not the entire foot! Imagine lugging boots and gear without a bag? It’d be nearly impossible, unless you wore it all! Years ago skiers simply used backpacks to lug gear. It worked. Approximately a dozen years ago, after a few days of skiing together in Vermont, my long-time powder partner Keith Morris commented on my backpack. Wearing what was then a test pack—an early isosceles-type Transpack®—I easily carried my gear without stressing my shoulders or arms. My hands were free! No longer is my Transpack® unique. But it’s still fabulous! Today, of course, there are better options. Still, not all bags are equal. Transpacks® are easily available, and boot bags vary widely. Find a style and color you prefer. No one retreats to the Killington Base Lodge because they are too warm! In the East insulated jackets, from down jackets to Thinsulate lined coats, remain popular. The sometimes biting chill of Vermont makes an insulated jacket warmly appealing. My latest jacket is a Patagonia jacket with a removable down sweater I received from my wife, Cheryl. Whether on the mountain or enjoying a winter walk on the coast, it’s warm and windproof. Truly, from The North Face to Columbia, insulated jackets vary in price as well as style, and the options are expansive! Decide what look, sizing and length meet your preferences, in addition, of course to functionality. Hard shells remain a multi-season staple. With year-round appeal, and with waterproof, windproof, and breathable technologies, shells offer an appealing shield against the elements and are also fabulous for winter hiking. Like insulated jackets, shells come with or without hoods and many offer powder skirts as well as pit zips to allow excess heat to escape. Remember, though, on cold days in the Northeast, shells need to be part of a multi-layered system. Compare and contrast at least two brands. Most offer some water proof technology but shells do vary. Many skiers enjoy matching a shell with a fleece or down sweater functioning as a liner. If you lack a shell in your wardrobe or are interested in a winter layering system, a hard shell is critical in creating that outer defense against the elements. Please save your jeans for après ski. This isn’t the 70s! Today’s mountain pants combine waterproof, windproof, and breathable technologies. Today, pants range from basic shells to more complex pants boasting variable “stretchable” material inserts to enhance flexibility and mobility. Some offer insulation. Some resemble shells and a soft shell technology. Some use a tough, hard shell technology, which skiers marry to a warm base layer. Most are water resistant or waterproof. Most have taped seams to minimize complaints against water access from melting snow or ice. Remember that cold chairlift? Modern pants can virtually block moisture. Stretch pants? Non-nylon pants nowadays boast soft shell technology, while nylon “type” ski pants boast a wide range of materials able to battle the elements. Truly, ski pants are worth the price. From approximately $150 for entry pants (boasting a waterproof technology with a soft shell knee panel) to higher-end offerings, ski pants offer style, warmth, and comfort for skiers and riders of all abilities. What mountain warrior does not own a fleece jacket? In addition to being a warm layer, it’s so soft and snuggly! Today, fleece offerings vary. Some are light and resemble a sweater. Some are heavier. Some are soft. Some use soft-shell technologies. Soft-shell technology has become a popular staple. A cross between a hard shell and fleece jacket, soft shells are often warmer and typically more wind-resistant than fleece, and many boast moisture management for perspiration. With many offering pit zips for enhanced comfort, and hoods tucked in collars, soft shells are a wonderful addition to an outdoor wardrobe. My wife and I wear our soft shells year round. Pull-over? Pit-zips? Whatever your choice, fleece comes in an array of colors and styles. Most are machine washable. With style, cut, and appearance variable, it can be worth comparing garments from several manufacturers. Traditional mountaineering companies such as The North Face or Patagonia sell popular soft shells but large retailers classically carry many soft shells from a vast array of companies. These are great stocking stuffers! Today, thermal base layers add critical warmth under ski pants, “wick” moisture away from the skin, dry quickly if damp, and add key warmth for a mountain outing. But they’re more than for legs. Turtlenecks and V-necks are also a key base layer worn under a fleece or sweater. Today’s new fabrics offer warmth without that damp cold of years past. 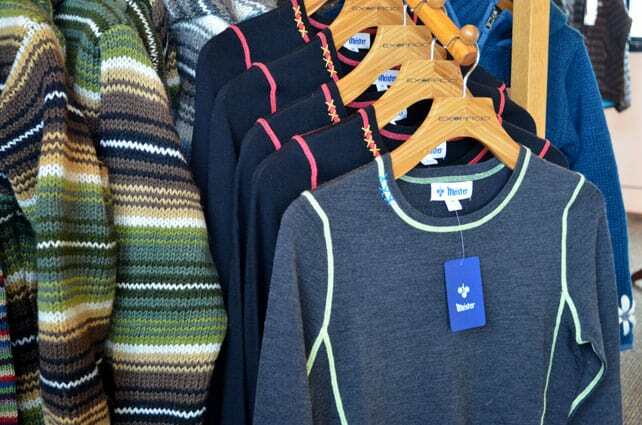 Area mountain shops offer an array of choices in mittens and gloves. Technology varies greatly! From Outdoor Research’s gloves with Gore-Tex inserts to Marker, fit and finish vary markedly. Some showcase padded knuckles for racers, some offer fleece inner liners, and some boast waterproof coatings. I like mittens with finger inserts! Face cream, neck warmer, utility carabiner, scarf, vest, gift certificate, gloves, vest, travel pillow, sweater, turtleneck, boot bag, Swiss knife, sunglasses, toe/hand warmer packets, ski wax, boot dryer, weather radio, snow shoes, helmet, ski poles, sunblock, ski or snowboard magazine subscription, glass anti-fog, goggles, ski or snowboard DVD. Contributing columnist Tony Crespi has served as both a ski school supervisor and coach. A contributor to publications throughout snow country.